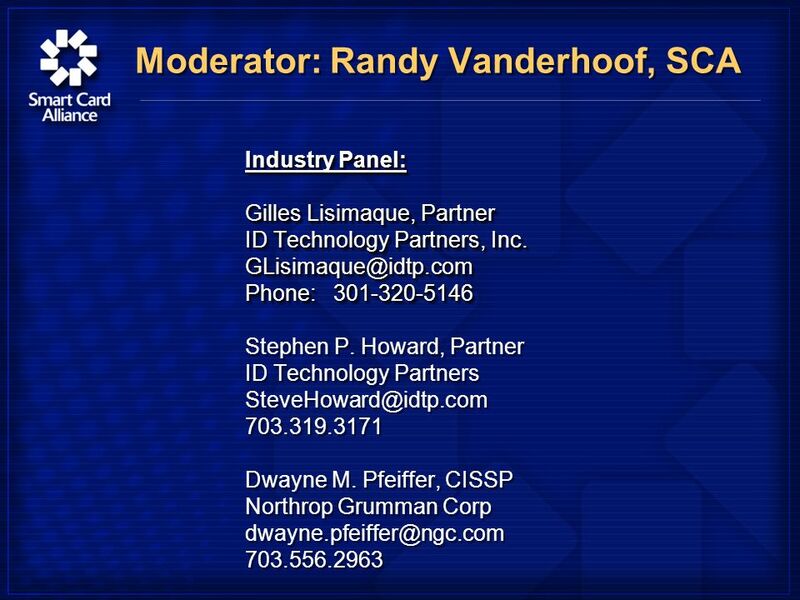 HSPD 12 Workshop May 5, 2005 Washington, DC HSPD 12 Workshop May 5, 2005 Washington, DC Smart Card Industry Panel: Delivering PIV compliant products. 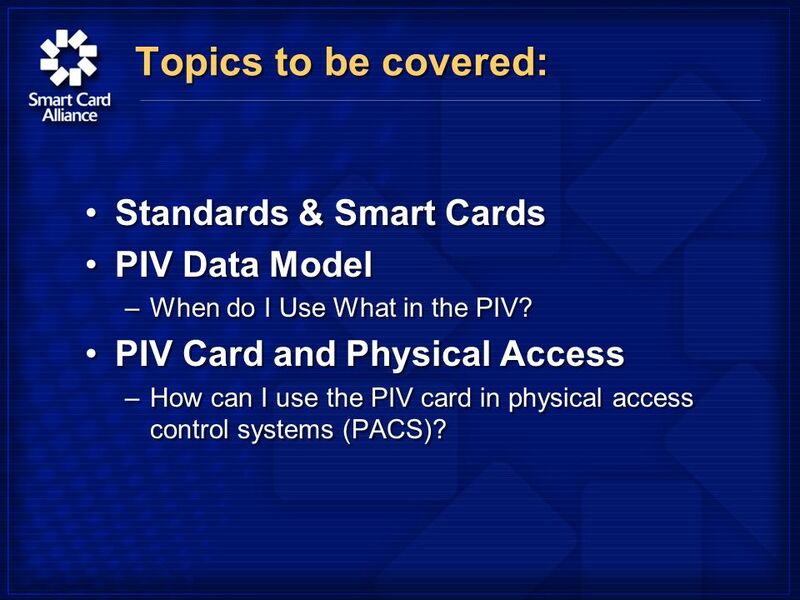 3 Topics to be covered: Standards & Smart Cards PIV Data Model –When do I Use What in the PIV? 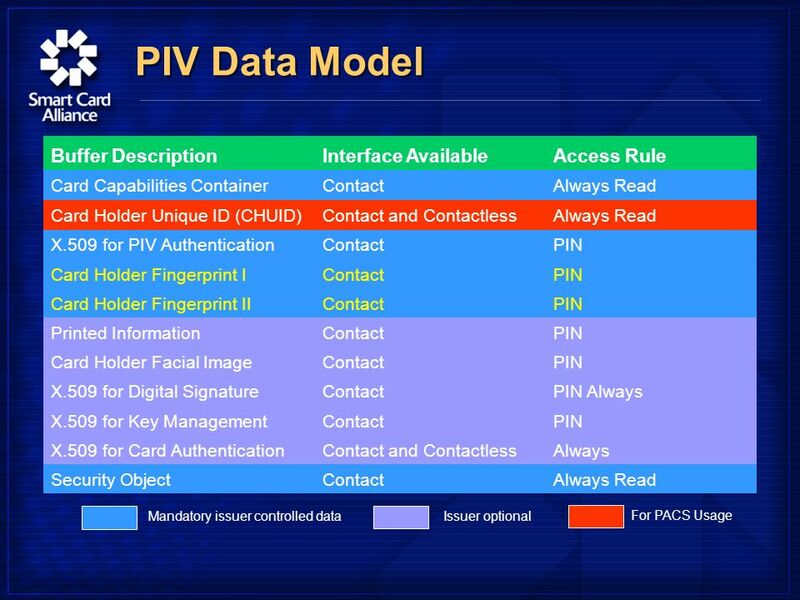 PIV Card and Physical Access –How can I use the PIV card in physical access control systems (PACS)? 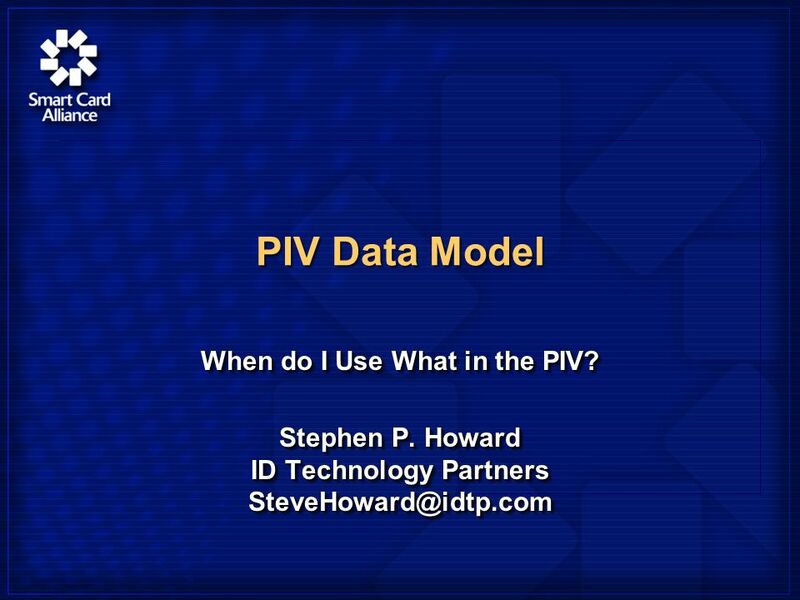 Standards & Smart Cards PIV Data Model –When do I Use What in the PIV? 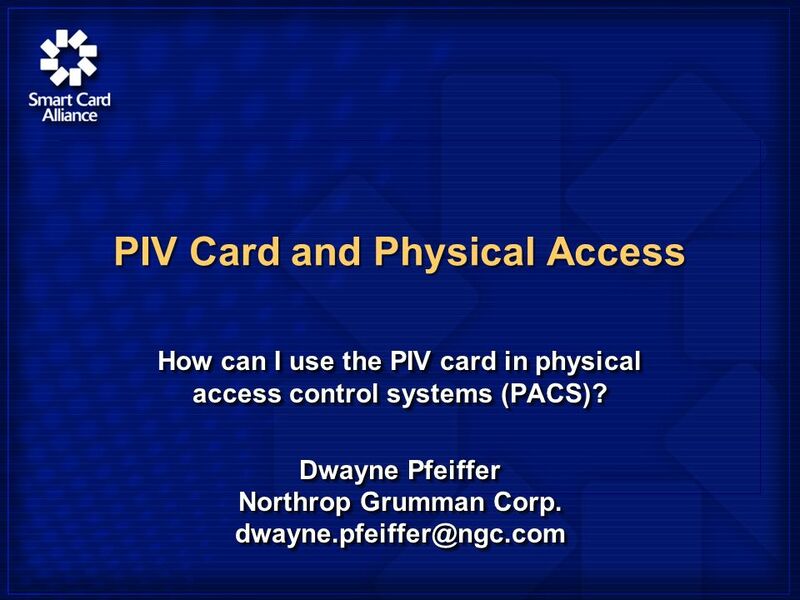 PIV Card and Physical Access –How can I use the PIV card in physical access control systems (PACS)? 5 In the Beginnings …. 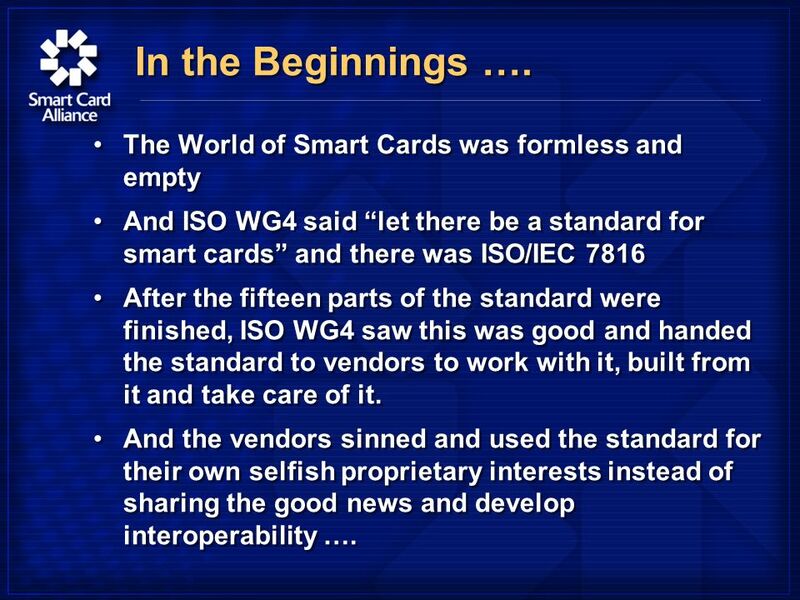 The World of Smart Cards was formless and empty And ISO WG4 said let there be a standard for smart cards and there was ISO/IEC 7816 After the fifteen parts of the standard were finished, ISO WG4 saw this was good and handed the standard to vendors to work with it, built from it and take care of it. And the vendors sinned and used the standard for their own selfish proprietary interests instead of sharing the good news and develop interoperability …. 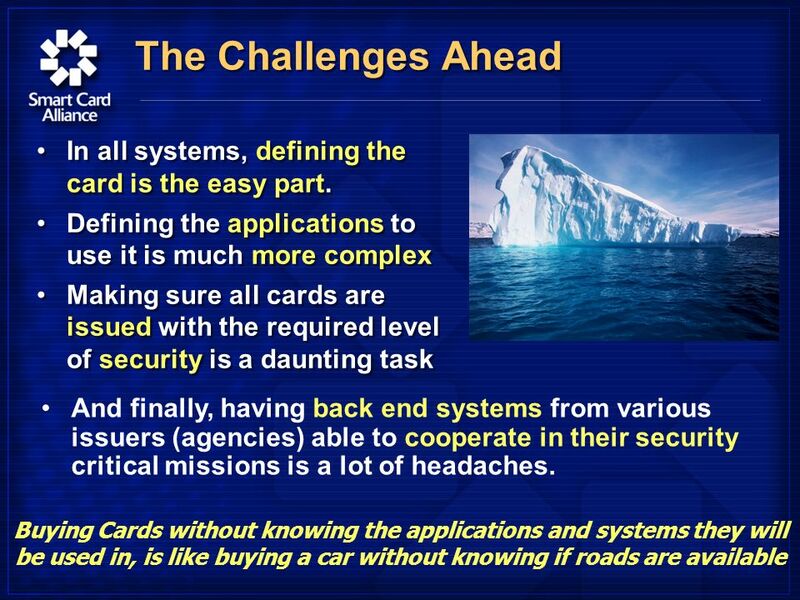 The World of Smart Cards was formless and empty And ISO WG4 said let there be a standard for smart cards and there was ISO/IEC 7816 After the fifteen parts of the standard were finished, ISO WG4 saw this was good and handed the standard to vendors to work with it, built from it and take care of it. And the vendors sinned and used the standard for their own selfish proprietary interests instead of sharing the good news and develop interoperability …. 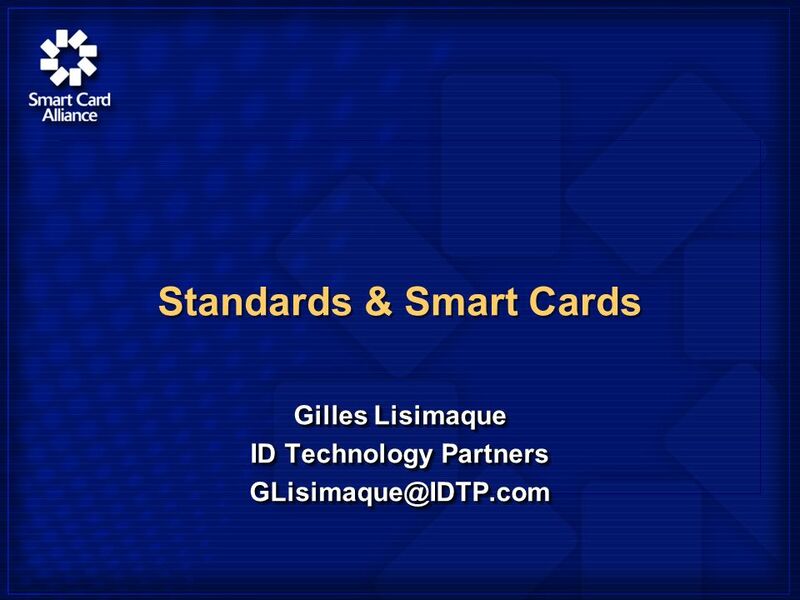 6 In the Land of North America … A new standard for smart cards (GSC-IS) was develop on the top of ISO 7816 in an attempt to restore interoperability. 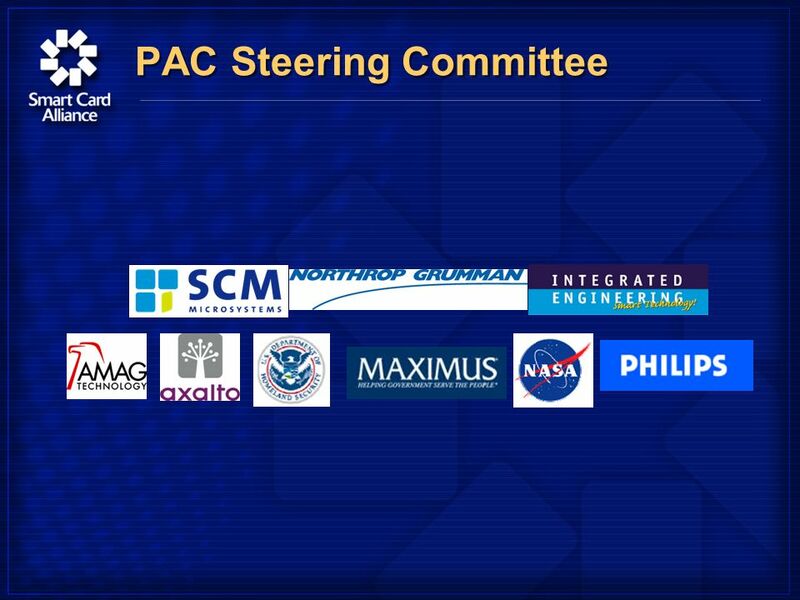 It provided: –Interoperable source of products (procurement) –Interoperable data models (data definition) –But it still allow applications to be on their own and did not succeed in providing interoperable applications using the various products. Without enough guidance, and using too often the letter of the law instead of its spirit, users of GSC- IS developed incompatible application languages and could not built the interoperable unified tower their leaders dreamed about. 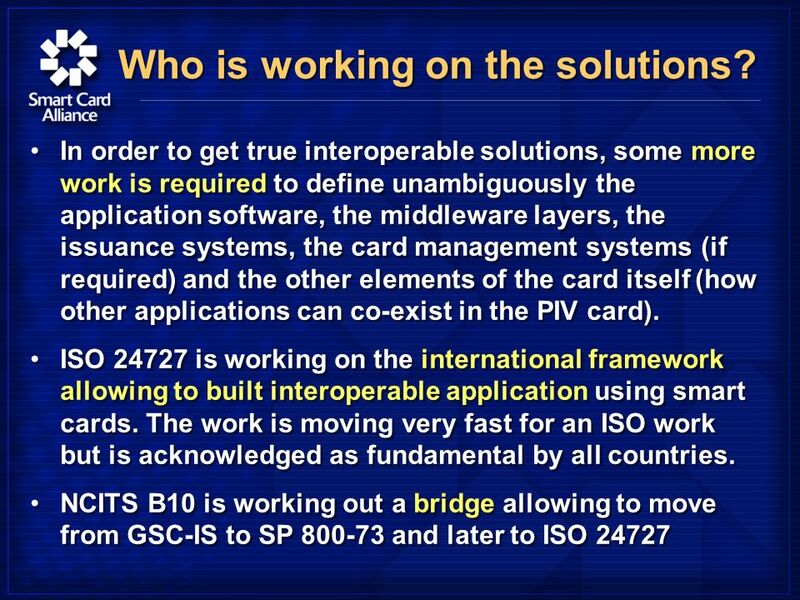 A new standard for smart cards (GSC-IS) was develop on the top of ISO 7816 in an attempt to restore interoperability. 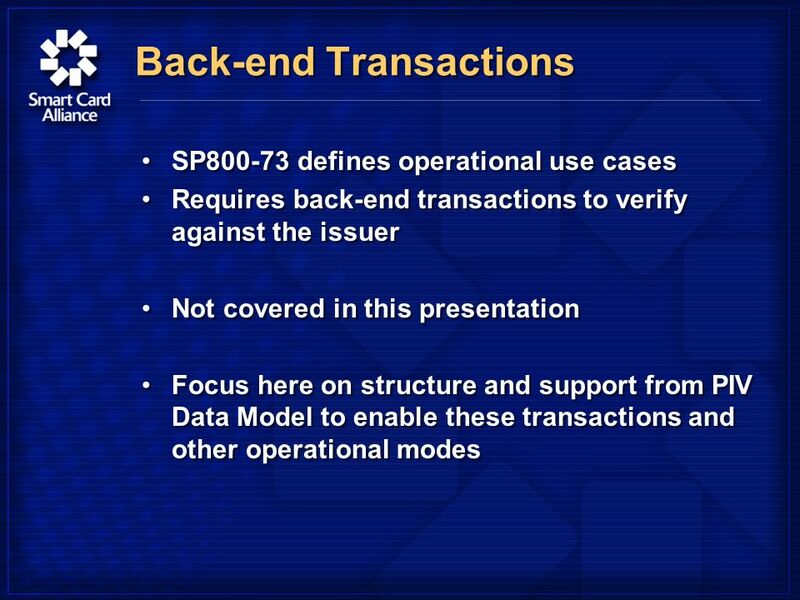 It provided: –Interoperable source of products (procurement) –Interoperable data models (data definition) –But it still allow applications to be on their own and did not succeed in providing interoperable applications using the various products. 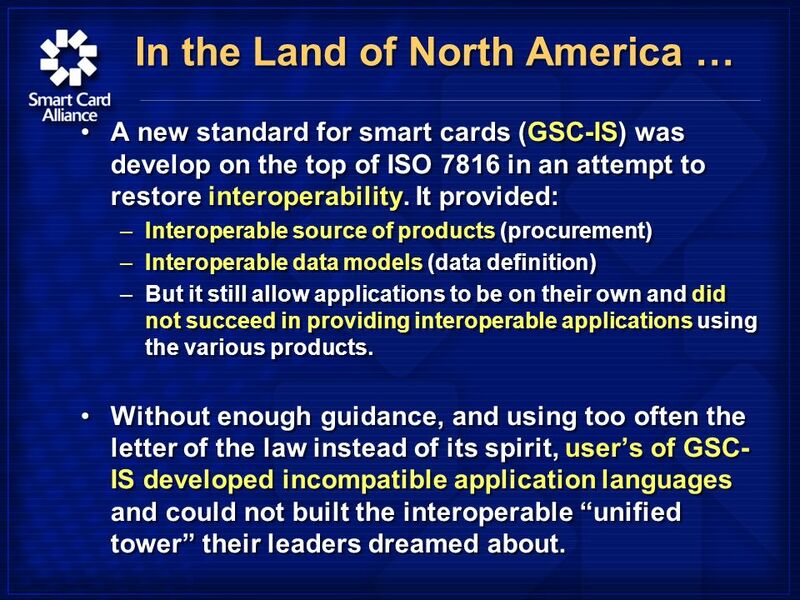 Without enough guidance, and using too often the letter of the law instead of its spirit, users of GSC- IS developed incompatible application languages and could not built the interoperable unified tower their leaders dreamed about. 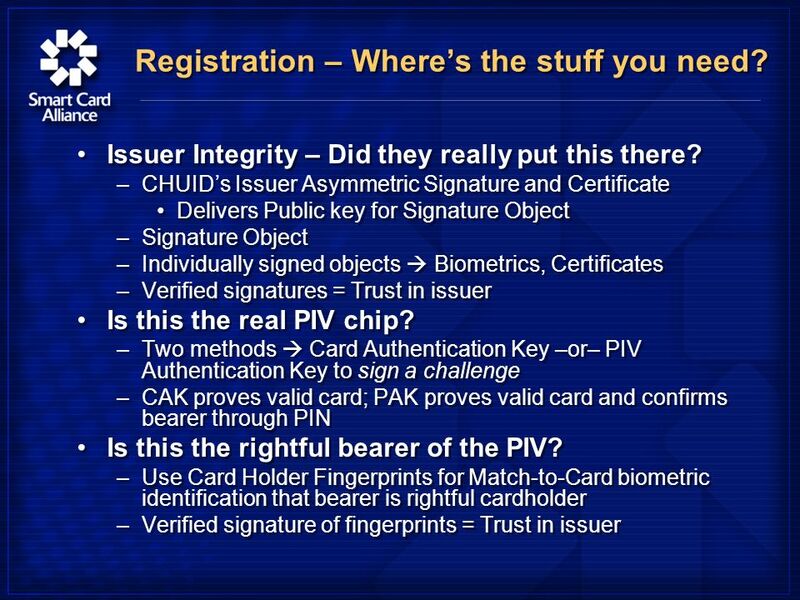 7 The Quest for Interoperability … The PIV application required true interoperability for cards, systems, back ends, between systems and during issuance in order to provide true security. 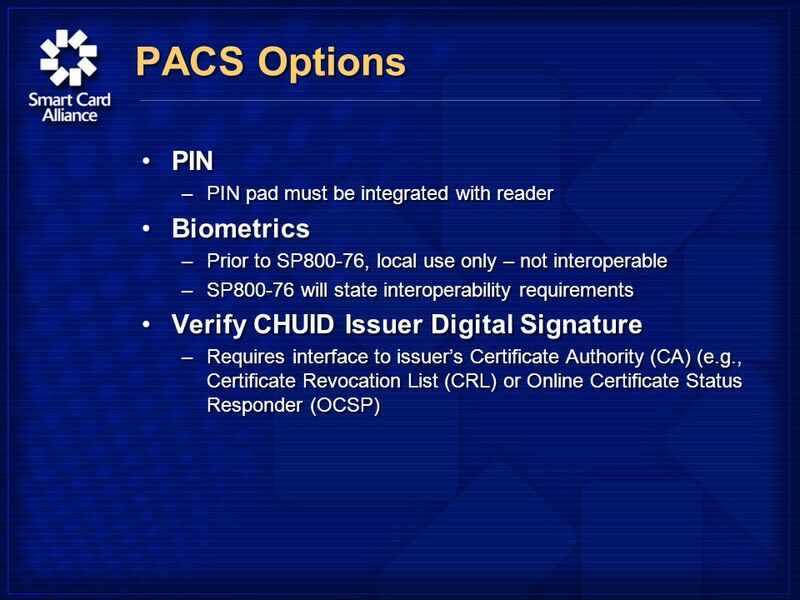 A new law for smart cards was developed for the land and was called SP 800-73. 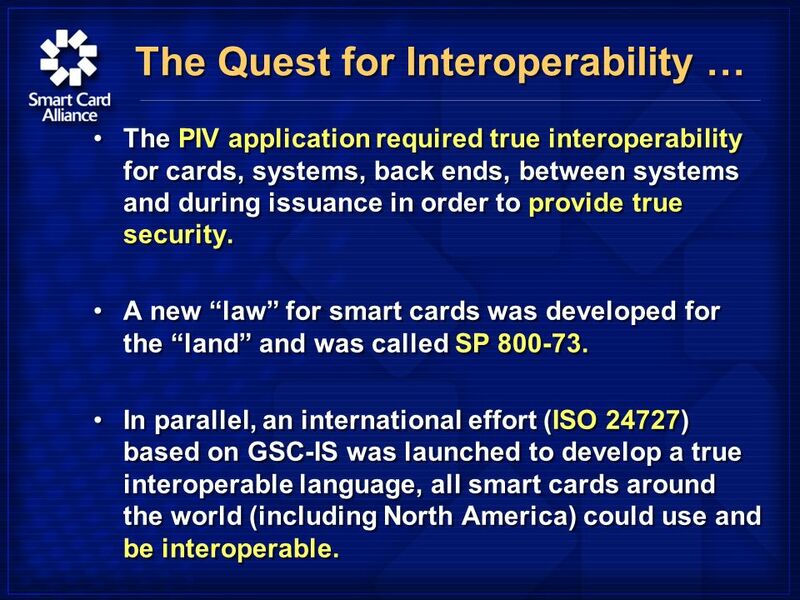 In parallel, an international effort (ISO 24727) based on GSC-IS was launched to develop a true interoperable language, all smart cards around the world (including North America) could use and be interoperable. 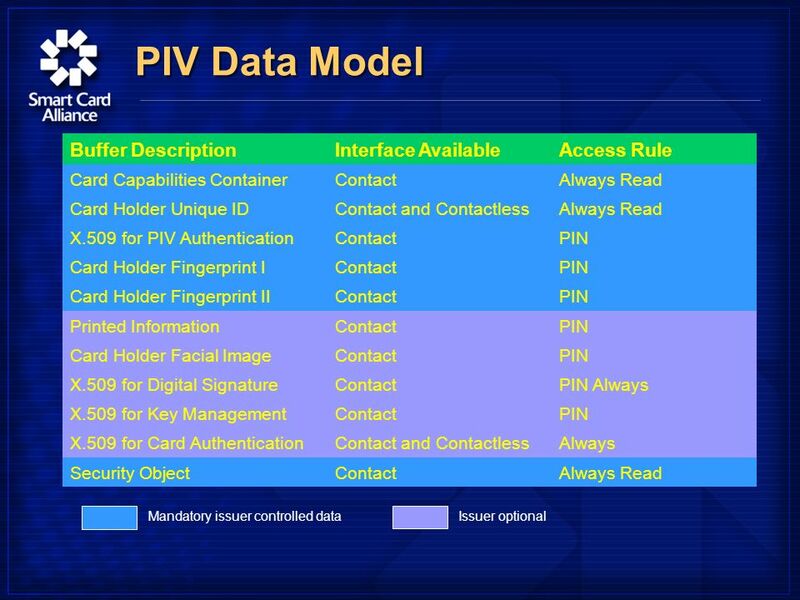 The PIV application required true interoperability for cards, systems, back ends, between systems and during issuance in order to provide true security. 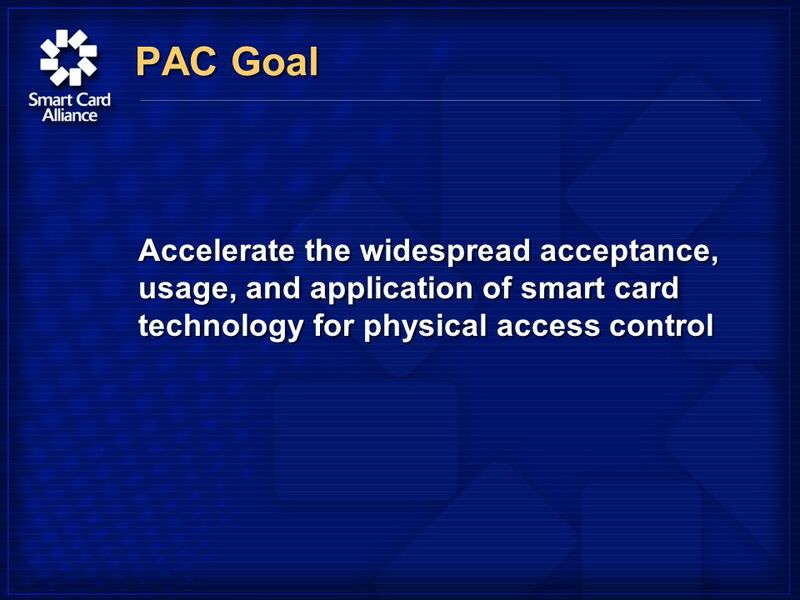 A new law for smart cards was developed for the land and was called SP 800-73. 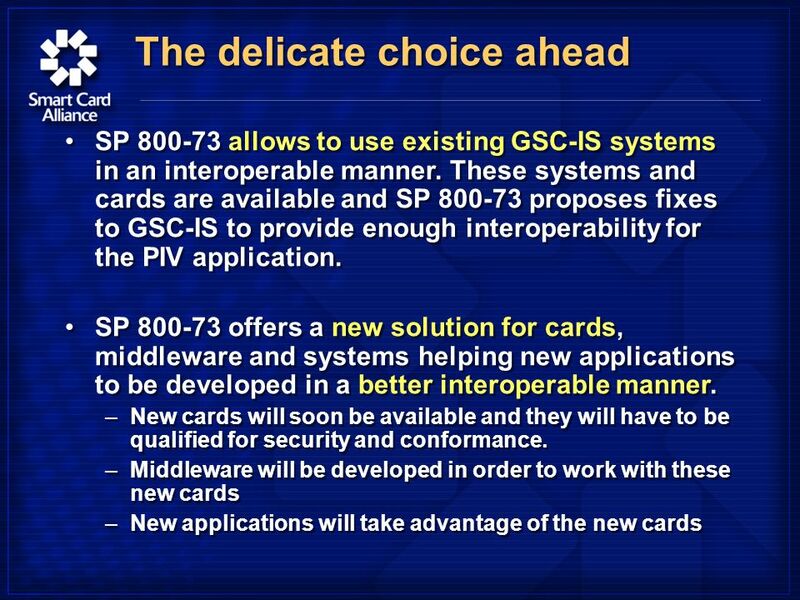 In parallel, an international effort (ISO 24727) based on GSC-IS was launched to develop a true interoperable language, all smart cards around the world (including North America) could use and be interoperable. 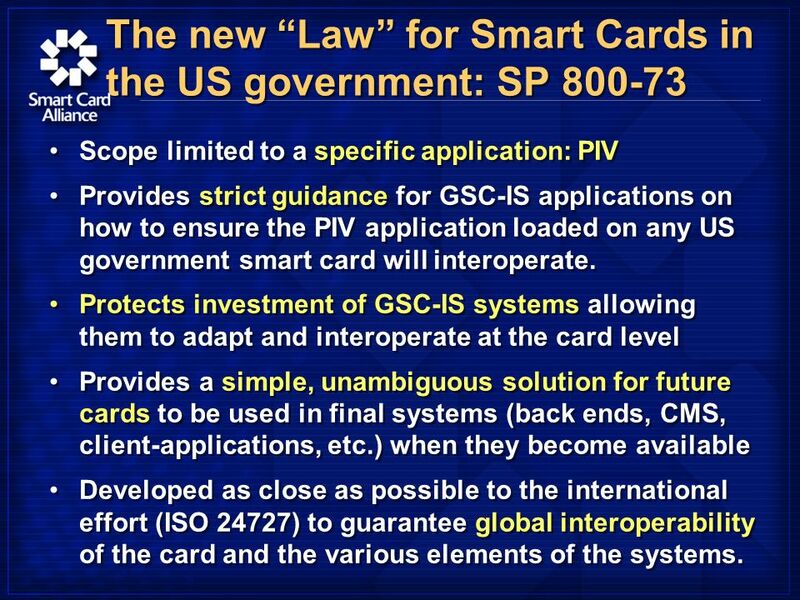 8 The new Law for Smart Cards in the US government: SP 800-73 Scope limited to a specific application: PIV Provides strict guidance for GSC-IS applications on how to ensure the PIV application loaded on any US government smart card will interoperate. 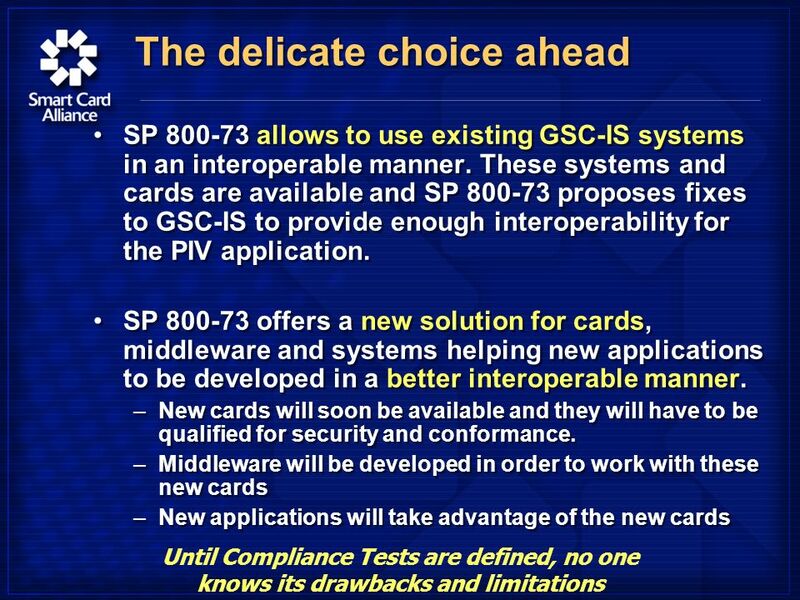 Protects investment of GSC-IS systems allowing them to adapt and interoperate at the card level Provides a simple, unambiguous solution for future cards to be used in final systems (back ends, CMS, client-applications, etc.) 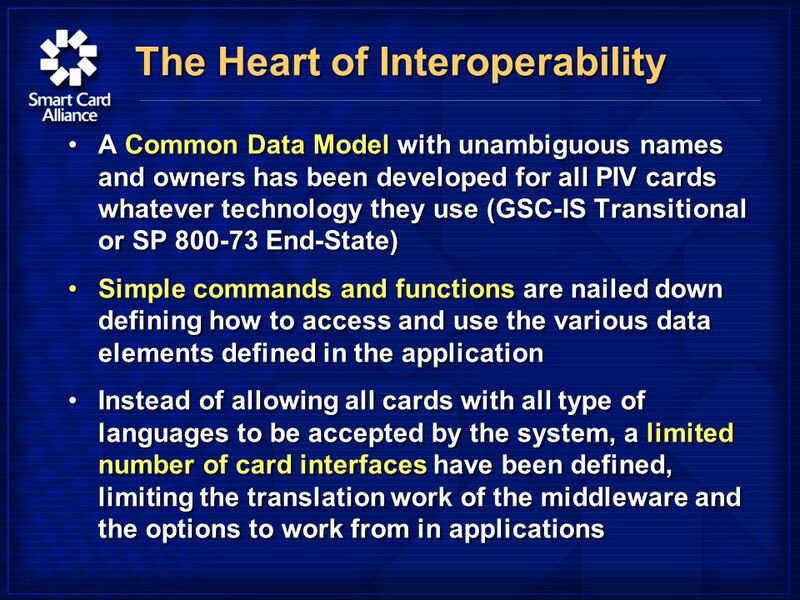 when they become available Developed as close as possible to the international effort (ISO 24727) to guarantee global interoperability of the card and the various elements of the systems. 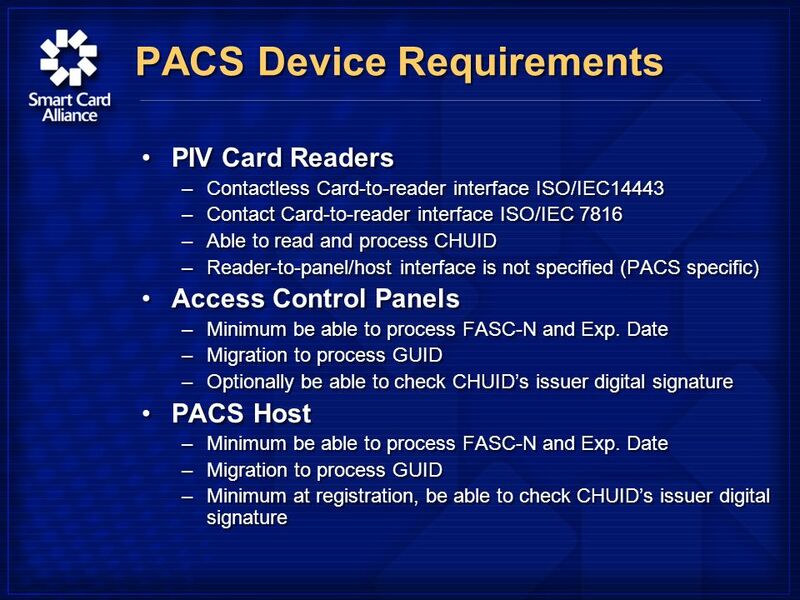 Scope limited to a specific application: PIV Provides strict guidance for GSC-IS applications on how to ensure the PIV application loaded on any US government smart card will interoperate. 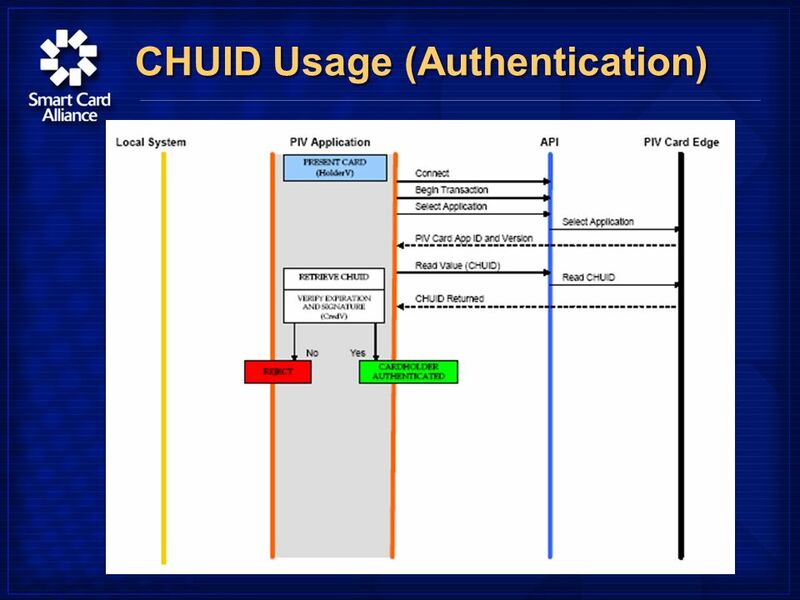 Protects investment of GSC-IS systems allowing them to adapt and interoperate at the card level Provides a simple, unambiguous solution for future cards to be used in final systems (back ends, CMS, client-applications, etc.) 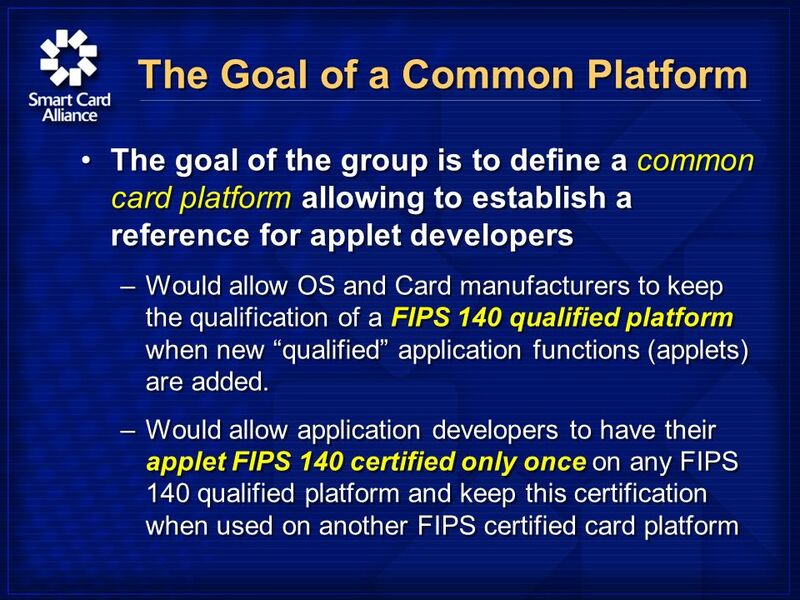 when they become available Developed as close as possible to the international effort (ISO 24727) to guarantee global interoperability of the card and the various elements of the systems. 23 When Do I Use What? 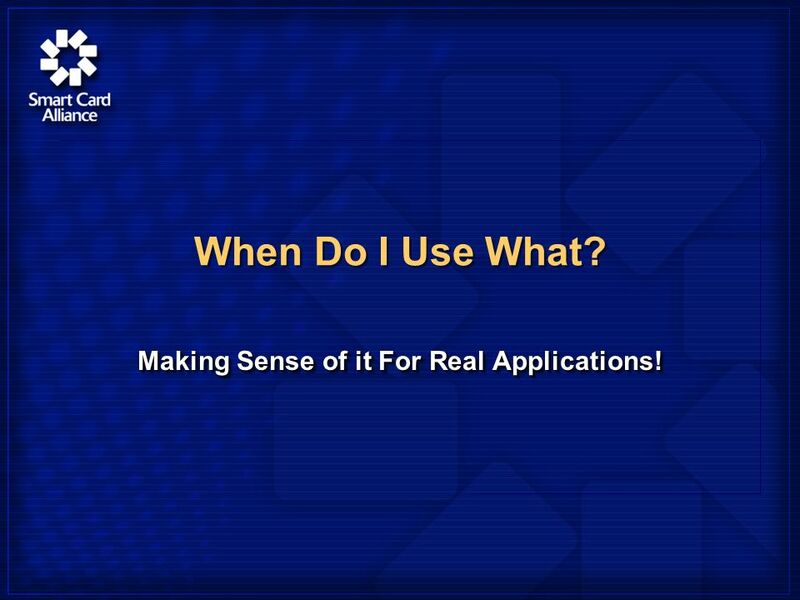 Making Sense of it For Real Applications! 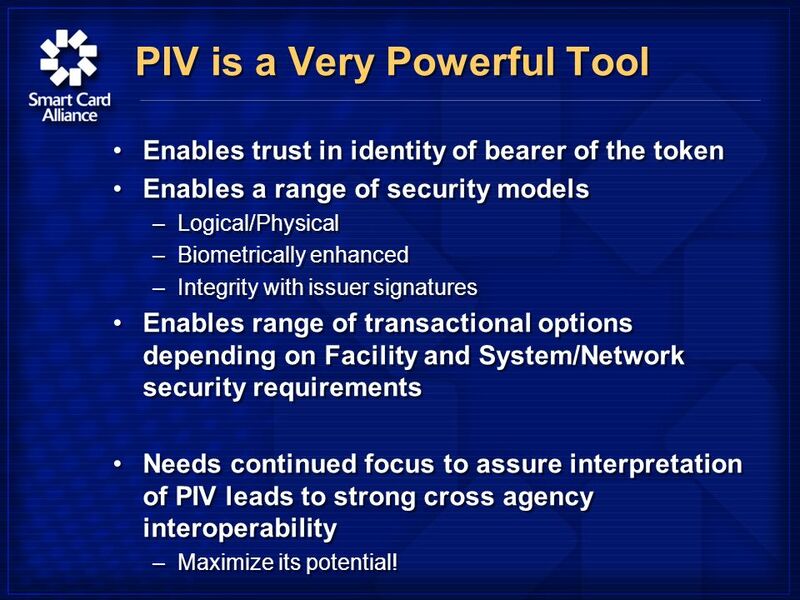 29 PIV is a Very Powerful Tool Enables trust in identity of bearer of the token Enables a range of security models –Logical/Physical –Biometrically enhanced –Integrity with issuer signatures Enables range of transactional options depending on Facility and System/Network security requirements Needs continued focus to assure interpretation of PIV leads to strong cross agency interoperability –Maximize its potential! 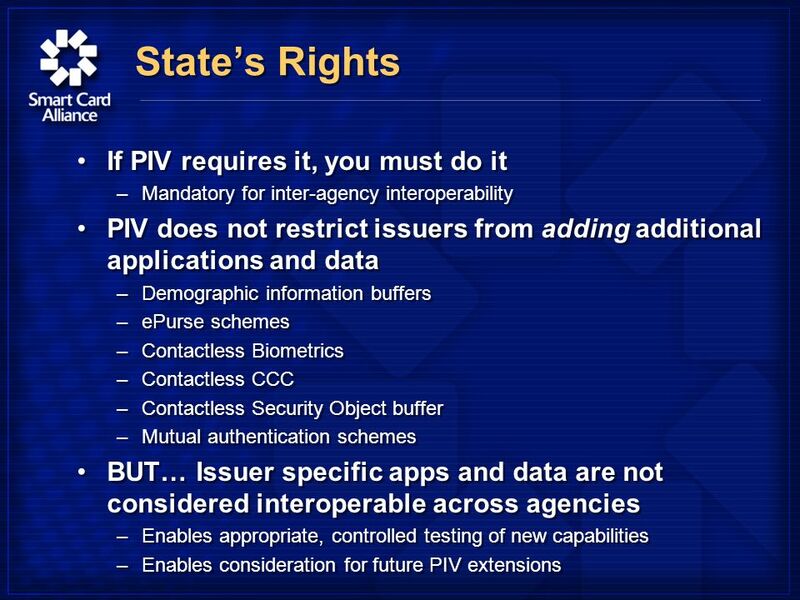 Enables trust in identity of bearer of the token Enables a range of security models –Logical/Physical –Biometrically enhanced –Integrity with issuer signatures Enables range of transactional options depending on Facility and System/Network security requirements Needs continued focus to assure interpretation of PIV leads to strong cross agency interoperability –Maximize its potential! 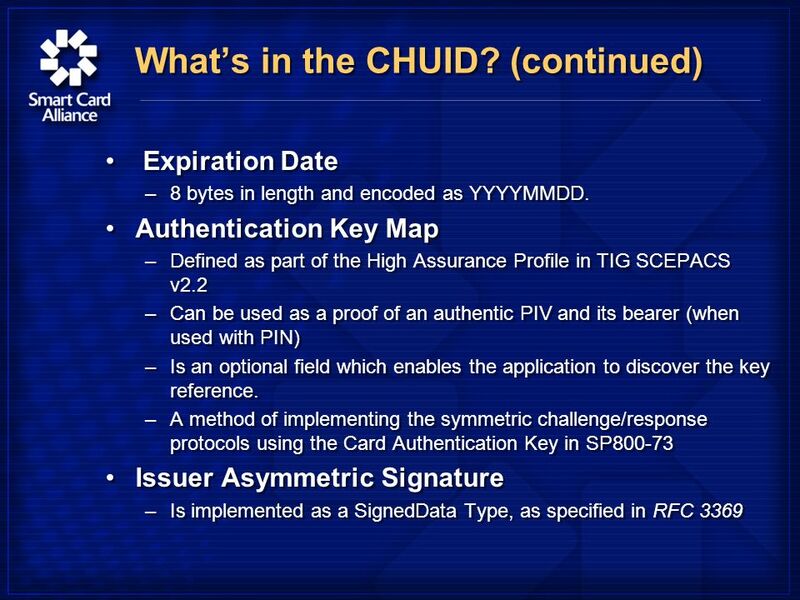 33 Whats in the CHUID? 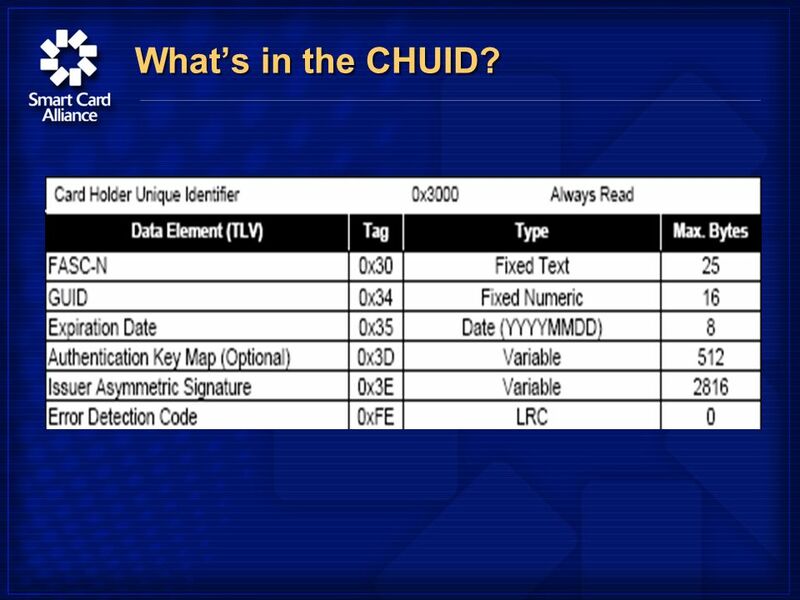 36 Whats in the CHUID? 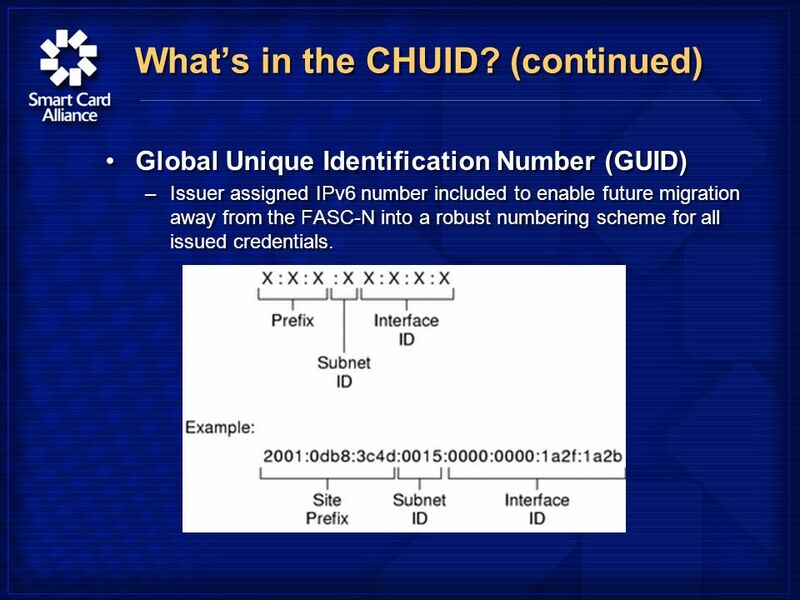 (continued) Global Unique Identification Number (GUID) –Issuer assigned IPv6 number included to enable future migration away from the FASC-N into a robust numbering scheme for all issued credentials. 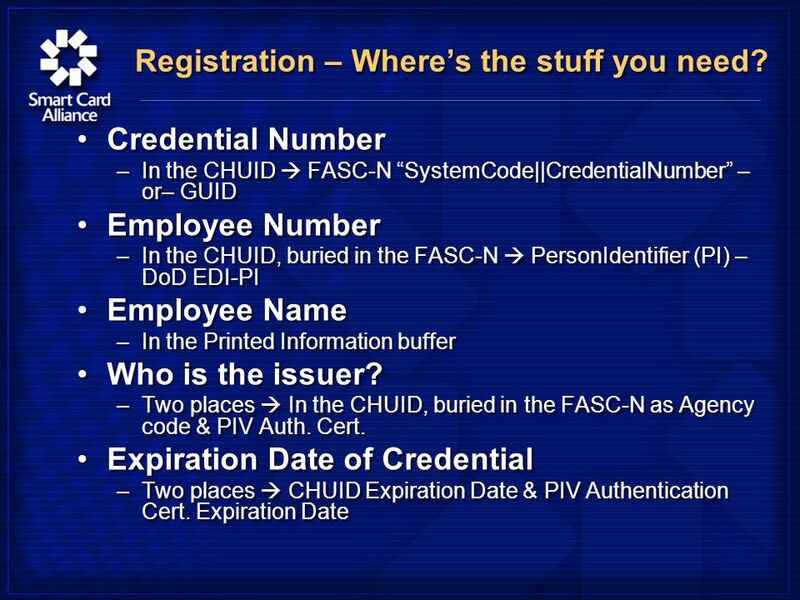 Global Unique Identification Number (GUID) –Issuer assigned IPv6 number included to enable future migration away from the FASC-N into a robust numbering scheme for all issued credentials. 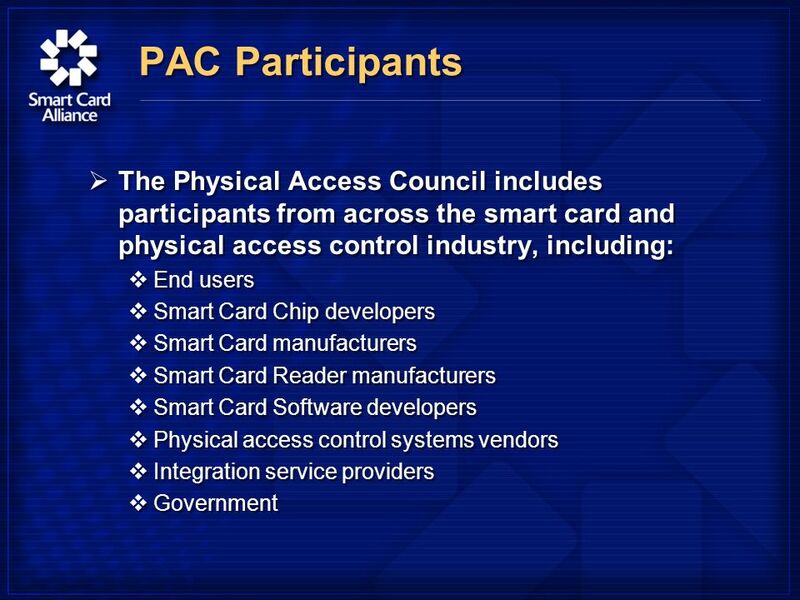 41 Physical Access Council (PAC) The Physical Access Council is the first of several new Smart Card Alliance Technology and Industry Councils This council has been created to foster increased collaboration within the physical access control system industry and market segment and to produce tangible results Speeding smart card adoption and industry growth. 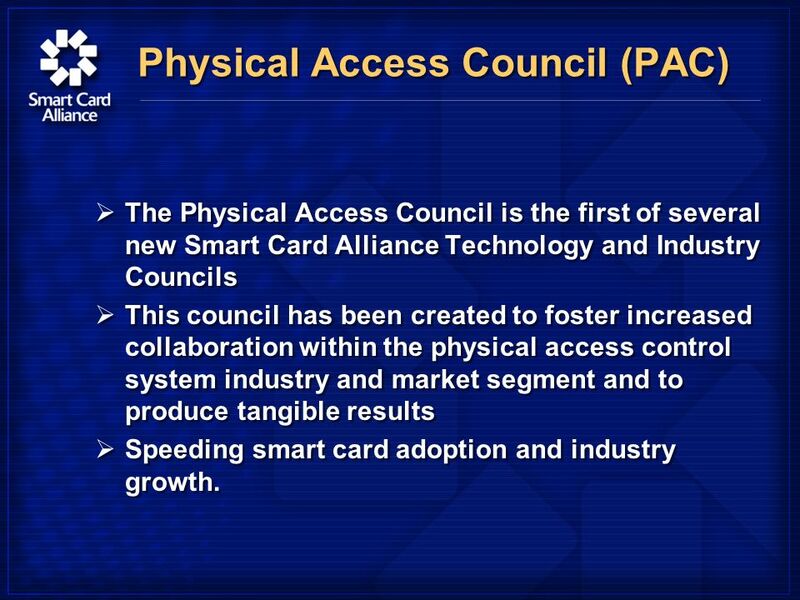 The Physical Access Council is the first of several new Smart Card Alliance Technology and Industry Councils This council has been created to foster increased collaboration within the physical access control system industry and market segment and to produce tangible results Speeding smart card adoption and industry growth. 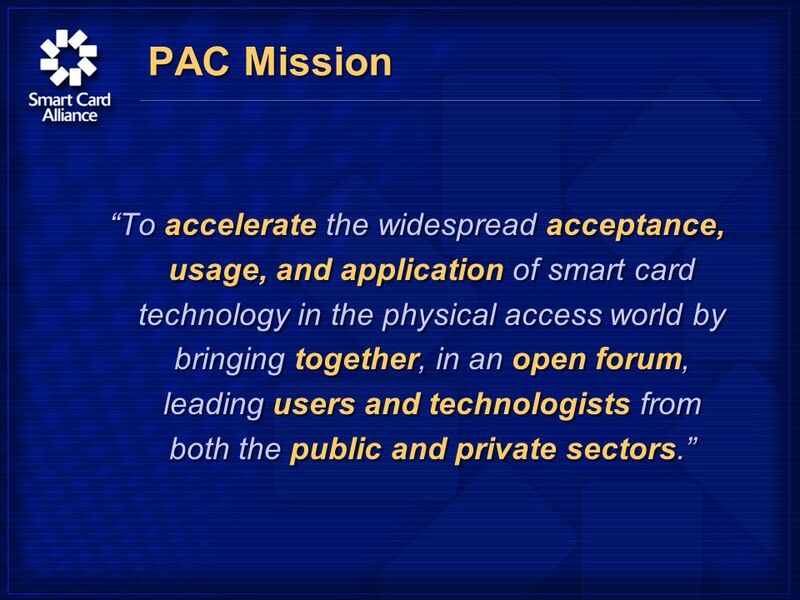 42 PAC Mission To accelerate the widespread acceptance, usage, and application of smart card technology in the physical access world by bringing together, in an open forum, leading users and technologists from both the public and private sectors. 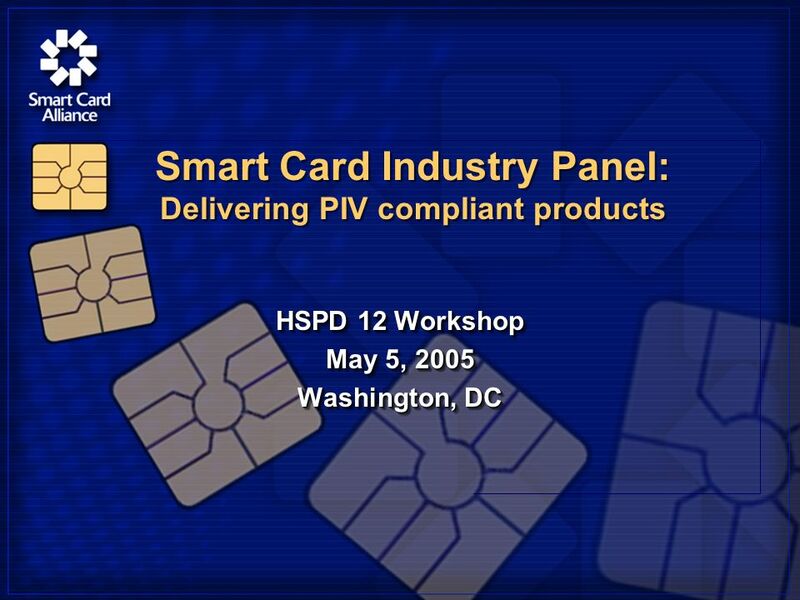 Download ppt "HSPD 12 Workshop May 5, 2005 Washington, DC HSPD 12 Workshop May 5, 2005 Washington, DC Smart Card Industry Panel: Delivering PIV compliant products." 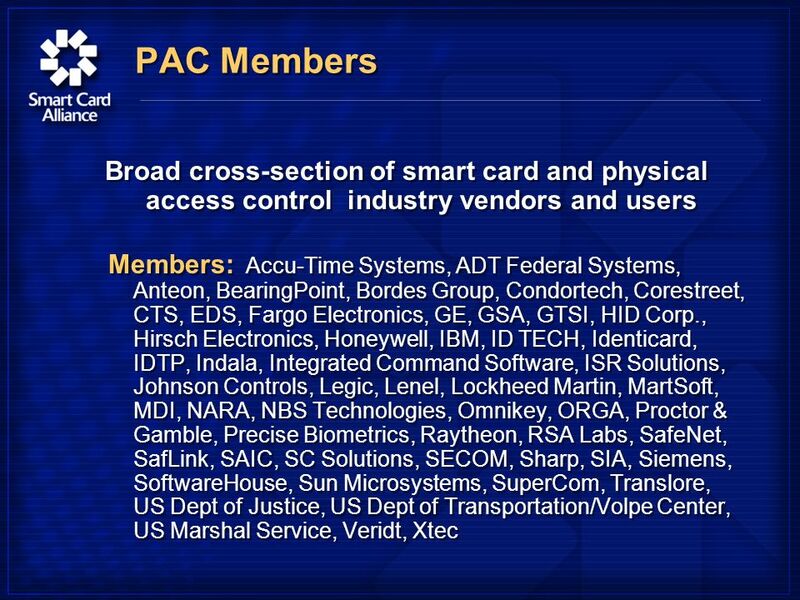 CardTech/SecureTech 2002 Government Smart Card Government Smart Card Smart Card Standards and the Government Smart Card Interoperability Specification. 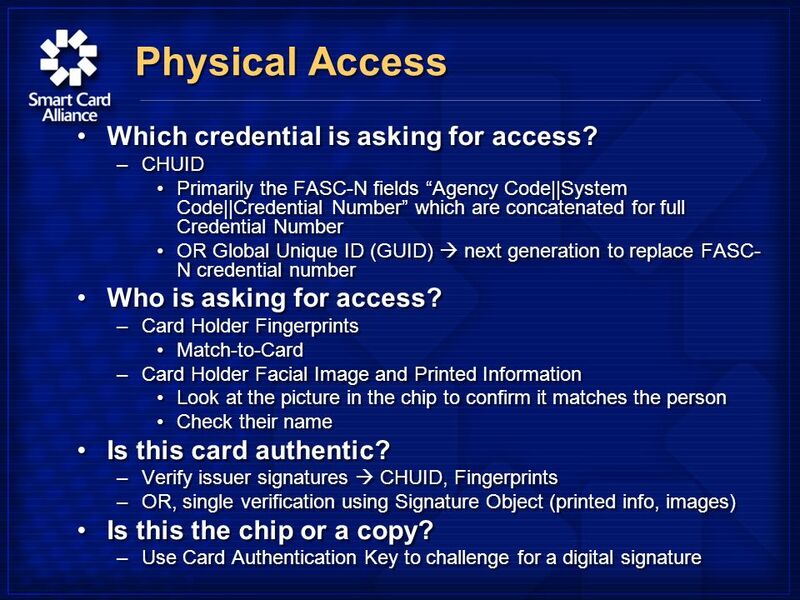 Card and Reader Overview Gerald Smith Sr. 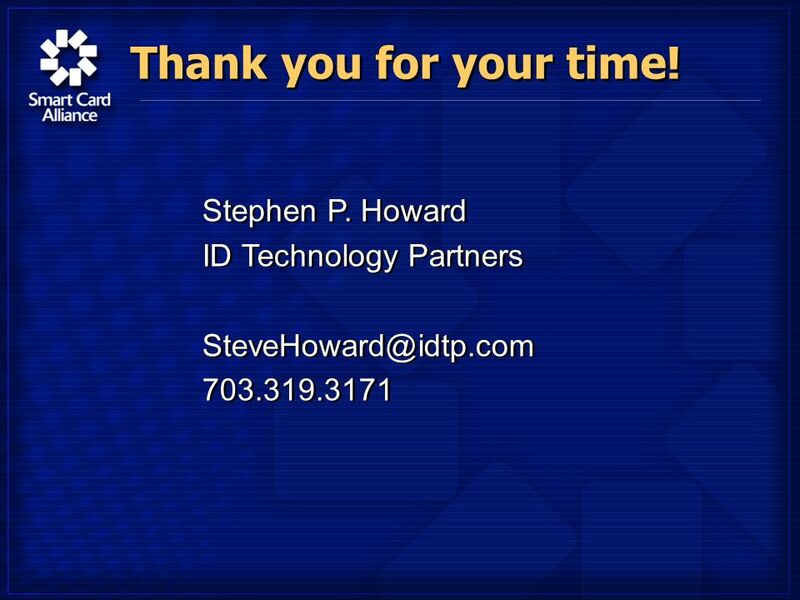 Consultant ID Technology Partners. 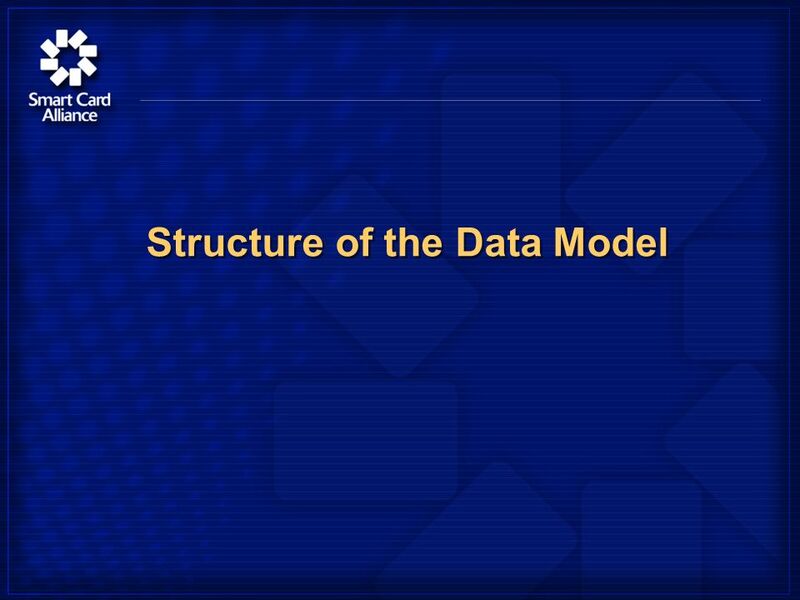 FIPS 201 Framework: Special Pubs ,76,78 Jim Dray HSPD-12 Workshop May 4/5, 2005. 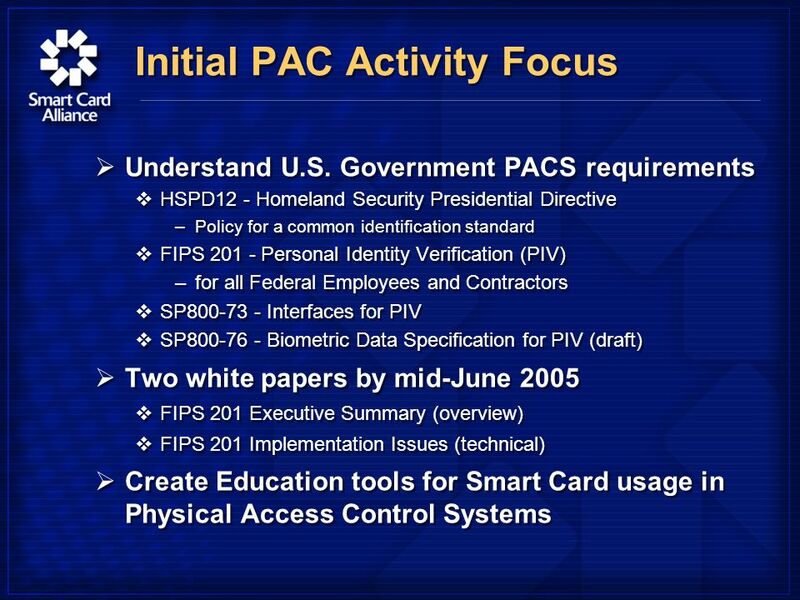 Status of U.S. Smart Card Deployment Jim Dray Porvoo 7/ World eID Meeting May 2005. 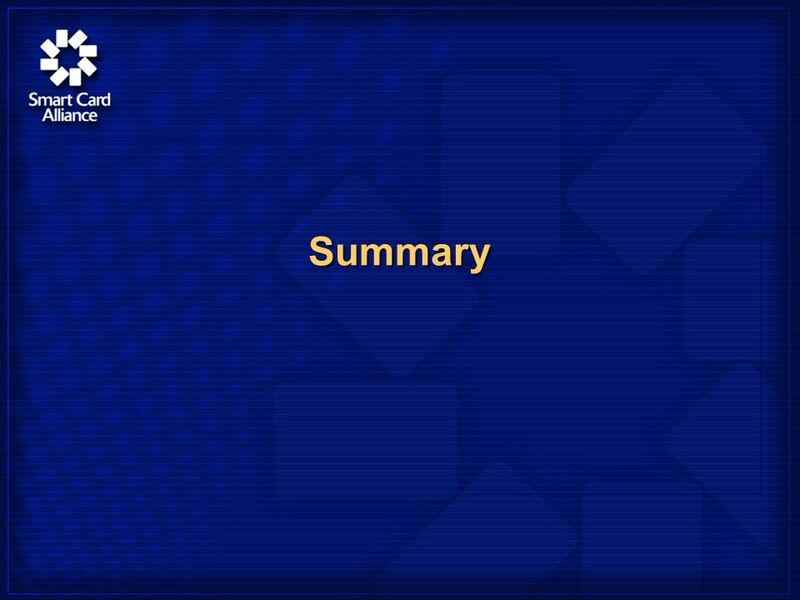 End Slide Format DO NOT place photos or additional text boxes on this slide. 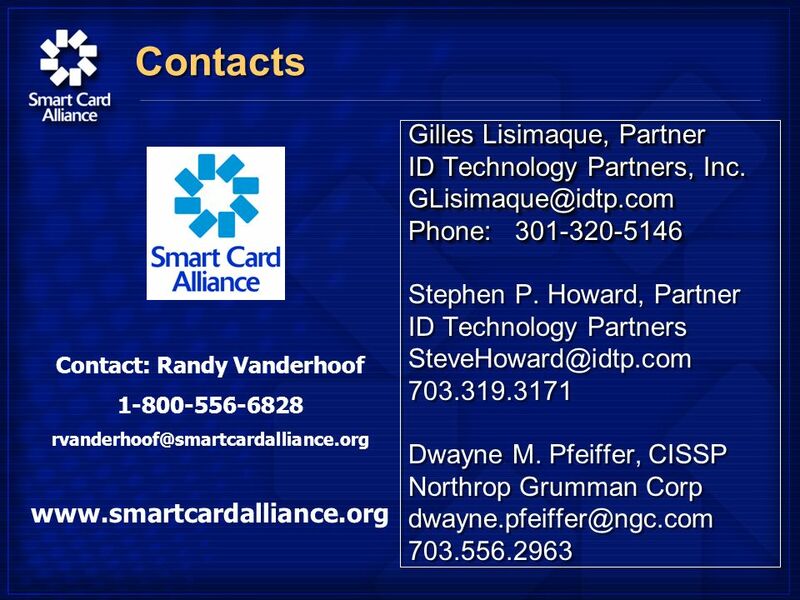 An ASSA ABLOY Group brand PROPRIETARY INFORMATION. © 2013 HID Global Corporation/ASSA. 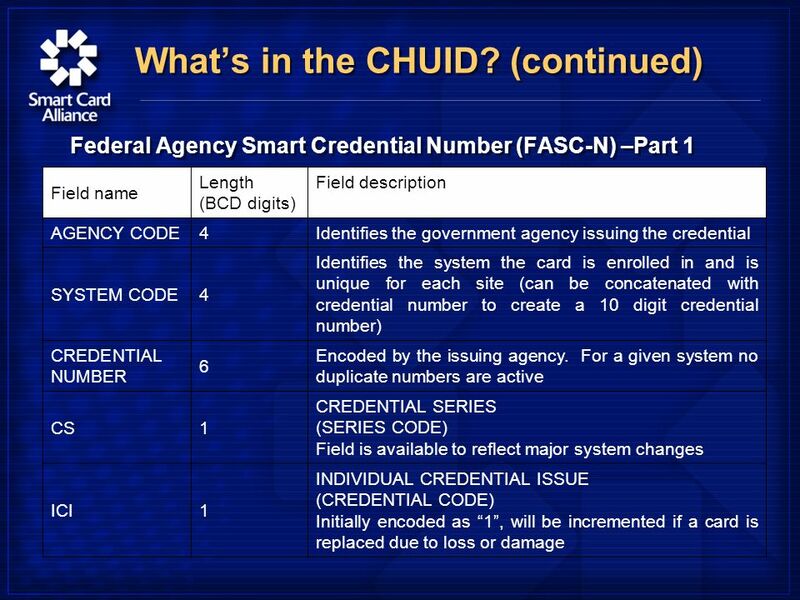 Overview of US Federal Identity Management Initiatives Peter Alterman, Ph.D. 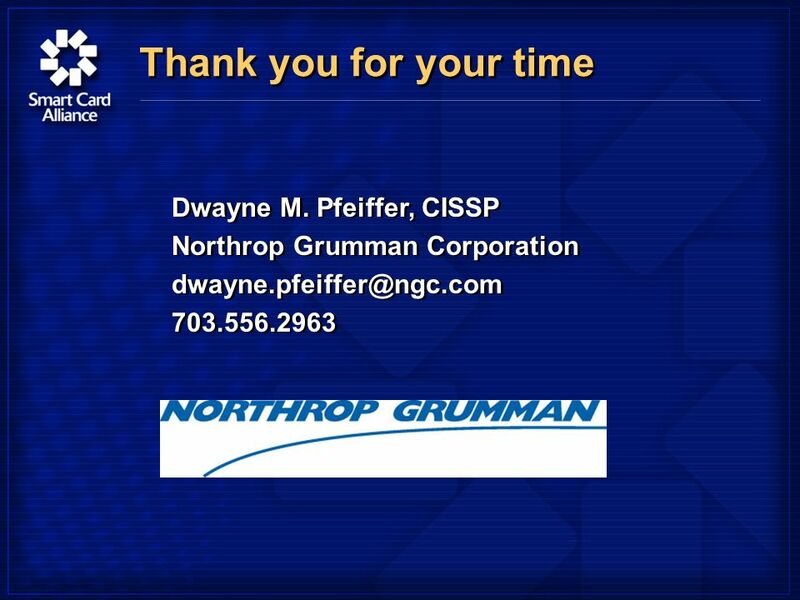 Chair, Federal PKI Policy Authority and Asst. 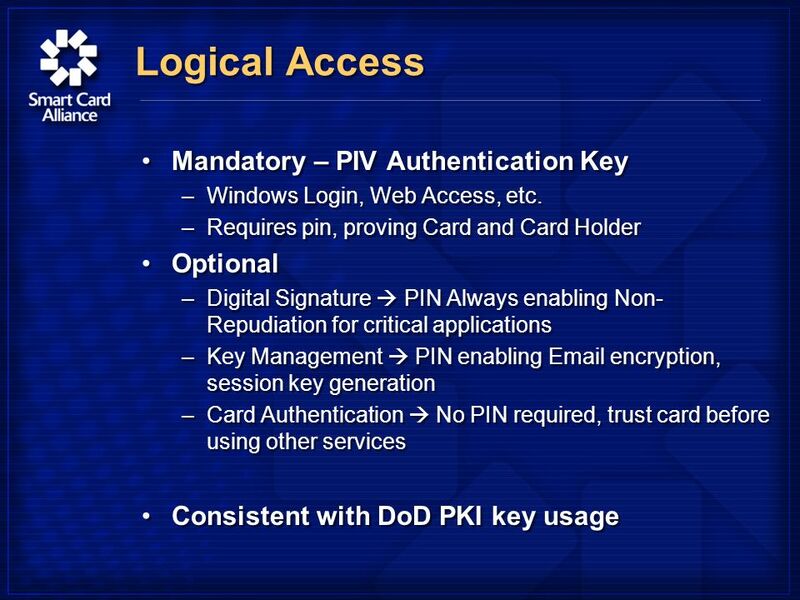 CIO E-Authentication, NIH. 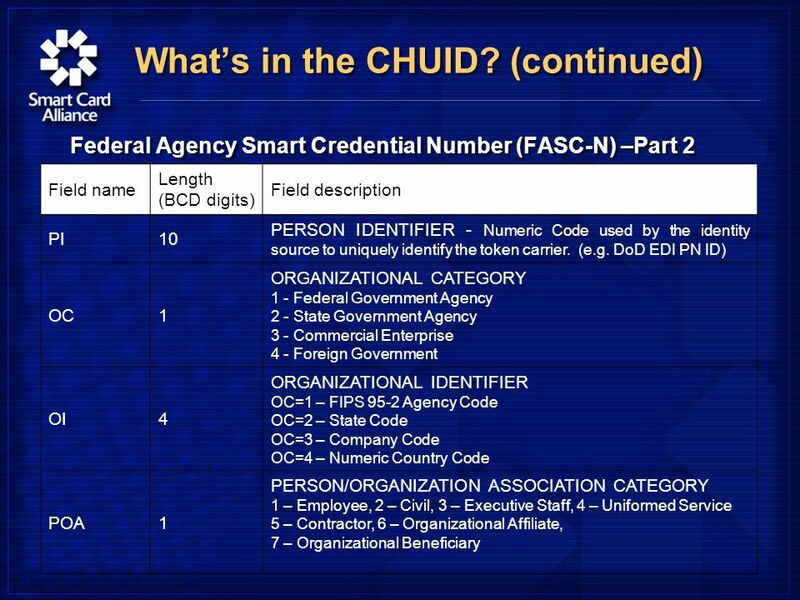 1 HSPD-12 Compliance: The Role of Federal PKI Judith Spencer Chair, Federal Identity Credentialing Office of Governmentwide Policy General Services Administration. 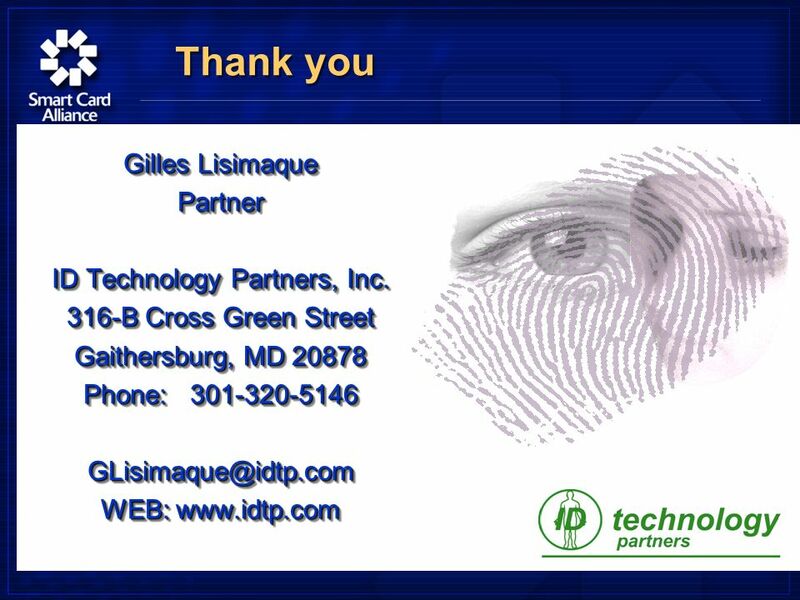 Digital Identity Group May GIXEL  GIXEL is the professional association of electronic component and system industries in France. It brings together. 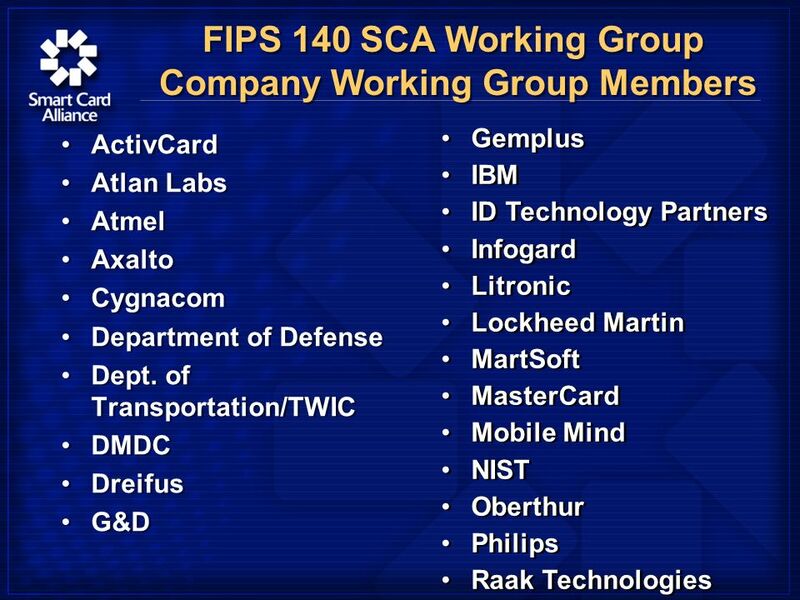 The Federation for Identity and Cross-Credentialing Systems (FiXs) FiXs ® - Federated and Secure Identity Management in Operation Implementing. © Southampton City Council Sean Dawtry – Southampton City Council The Southampton Pathfinder for Smart Cards in public services. 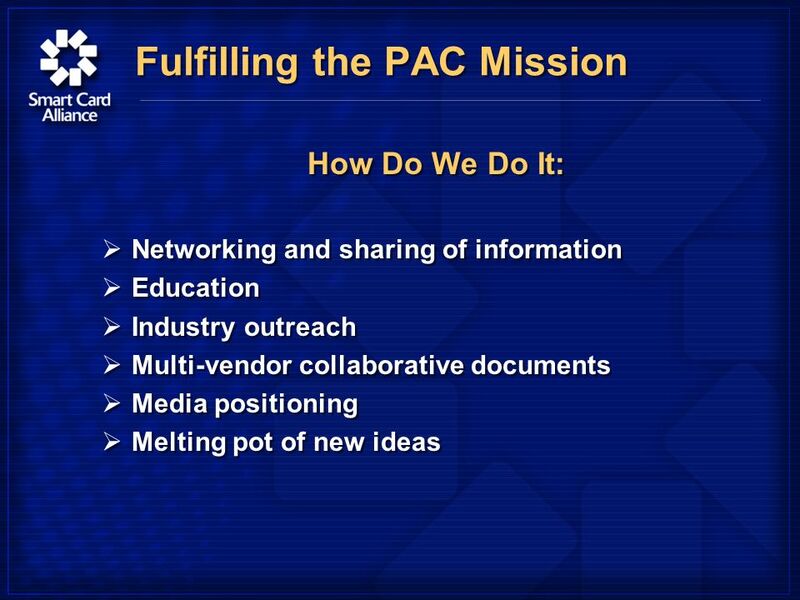 The 4BF The Four Bridges Forum Federated PACS A Physical Access Use Case for Bridges FIPS 201/PIV-I PACS Interoperability April 28 th, 2009.